IMPORTANT NOTE: Please note that we will discontinue offering Microdermabrasion as of Jan 1 2018. If you are interested in advanced peeling procedures please refer to GeneO+. At Lege Artis Clinic we employ Advanced European Microdermabrasion equipment by Reviderm™ (Germany). It is safe and effective for all skin types and colours and has virtually no downtime and no side effects compare to more aggressive resurfacing treatments. Microdermabrasion optimizes skin regeneration as damaged and aged skin layers are gently and effectively removed. You will see your skin texture and colour visibly improved right after the very first session. You can restart your day directly after treatment - feeling fresh and relaxed. As this treatment is non-invasive you can apply a fragrance-free non irritating make up right after the treatment. You may return to work immediately afterwards. Series of treatments are usually recommended. Consult with your Lege Artis skin care practitioner - how many treatments and at what intervals will deliver the best results for your particular skin. Body microdermabrasion treatments are also available on request. (c) Lege Artis Toronto Clinic. 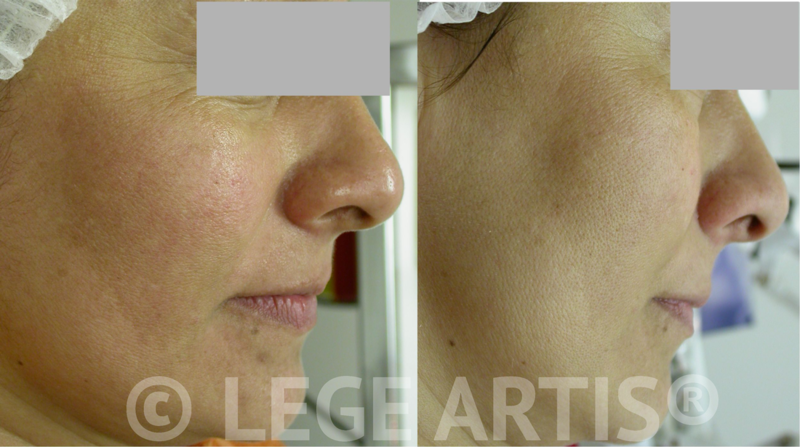 Results in a skin type VI female client (forehead) after one session of Microdermabrasion combined with Extractions after one month interval. Note smoother and clearer skin, and a visible reduction of comedones (bumps) with improved skin texture. Click on the photos to enlarge. Extractions - for acne prone skin - to clear the clogged pores and prevent acne flair ups. Please note that acneic or very congested skin types might require our Signature Deep Pore Cleansing Facial treatment prior to a Microdermabrasion due to sensitivity or a number of extractions necessary - please consult your Lege Artis skin care specialist to find out what will work best for your skin. Microdermabrasion removes damaged topical layers of the skin thus increasing the absorption of the therapeutic light and the effectiveness of the Light Therapy. (c) Lege Artis Toronto Clinic. Click on the photos to enlarge. A combination of series of Microdermabrasion with Omnilux™ Light Therapy (Revive™ and Plus™) was effective for this client. Do not wax or thread the treatment area for at least 1 week before and after treatment.